"Without certification it's difficult to do business"
"The flower industry in Colombia is focused on fair treatment for employees. Pension and health insurance funds are well arranged. In that respect, we don't differ much from the Netherlands in terms of legislation," says Frans Buzek, who works at La Gaitana Farms. According to Frans, this is due to the internationally-oriented nature of the country. "Certification is becoming increasingly important," he says. "Without it, it is difficult to do business. It's just something that the market increasingly demands. Supermarkets like to hang labels on their products. Europe is leading in this, followed by the United States. Also in Japan there is increasing attention for sustainability. Our carnations are Rainforest Alliance certified. This means that our production is sustainable in the environmental, social and economic fields. In order to maintain the quality mark, annual audits are carried out." 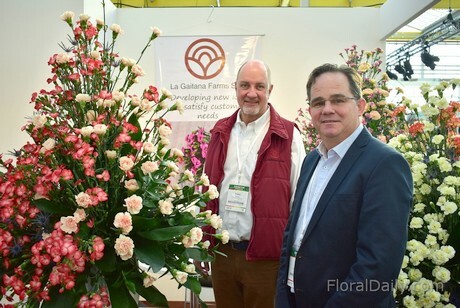 Frans Buzek of La Gaitana Farms with Eric Janken of Arabella Flower Farm during the IFTF 2018 in Vijfhuizen, the Netherlands. On the left the new Solomio, and on the right Appletea, an old favorite. La Gaitana was founded in 1984 and the company grew to 42 hectares in recent years. "We have 600 employees, 80 percent of whom are women," says Frans. It is one of the differences with the Netherlands. "In the Netherlands flowers are mainly a men's business." 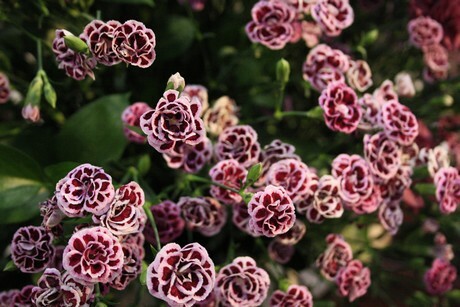 La Gaitana delivers carnations to the USA, Europe and Japan. "Especially the US is an excellent market for us. Economic growth is increasing, and people spend more money on flowers. Our sales mainly go to supermarkets. They offer a better price for the consumers than florists. The higher prices of florists create an occasion culture, while the supermarkets stimulate more frequent purchases." 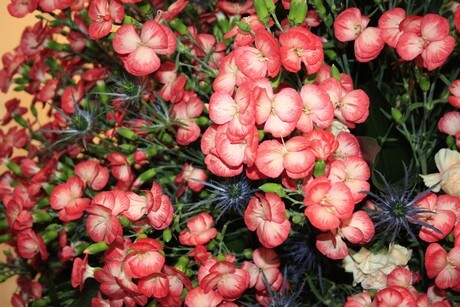 During the IFTF the carnation breeder showed off their latest varieties: the little Sparkz Raffine and the Sparkz Solomio, which has a completely different character. Both species come from Hilverda Kooij. "The Solomio has not been on the market for very long. It's doing well on the American market. Japan prefers a carnation with more leaves, like the Raffine. We've been working on it for a year now." Frans says that shorter lines in the logistics chain are a global trend. "Only parties that add value remain in the chain. In addition, more orders are being delivered and more producers are selling online." For the future, Frans sees growth potential in countries where cut flowers aren't sold yet. He also sees a challenge in building alliances with customers. "Growing a carnation takes seven months. It's always a gamble for the grower to estimate the right colors, varieties and quantities that the customer will want. That means that both the grower and the customer are at risk. When the two start working together, a win-win situation is created. The grower has more certainty for his sales and the customers get what they want."